Home » What are King Tides? 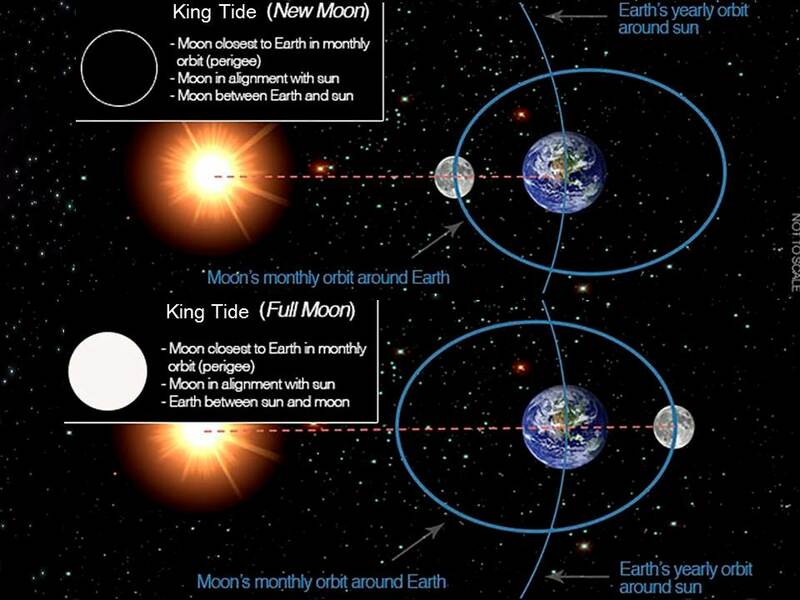 While the term ‘king tide’ isn’t a scientific term, it is used to describe an especially high tide event occurring twice a year, when there is alignment of the gravitational pull between sun and moon. When king tides occur during cyclones, floods or storms, water levels can rise to higher levels and have the potential to cause great damage to property and the coastline. are not an every day occurrence. To avoid confusion, it’s important to know that king tides aren’t part of climate change; they are a natural part of tidal cycles but they do give us a sneak preview of what higher sea levels could look like. The actual height reached by a king tide will depend on the local weather and ocean conditions on the day. It is possible that by 2060 to 2070 we could experience tides of the magnitude of king tide events every month due to sea level rise induced by climate change. This project aims to promote awareness of the impacts of sea level rise, and help to visualize coastal areas that are vulnerable to tidal inundation which can be monitored over time. Learn more about sea level rise.